Today, I thought I’d tell you all about our pets and the animals in my life. I love animals and would never want to be without them. They keep me smiling when times are tough and are always there. Anyone who says they never answer back though, clearly isn’t listening!! Either that or I know some pretty opinionated animals! The first ones to introduce you to are the cats. We have three cats, Miew, Trouble and Spice. This is Miew, large, handsome and very stupid. In fact the saying “as quick as a box of rocks” really does describe him. We got him from a farm as a kitten for £20. 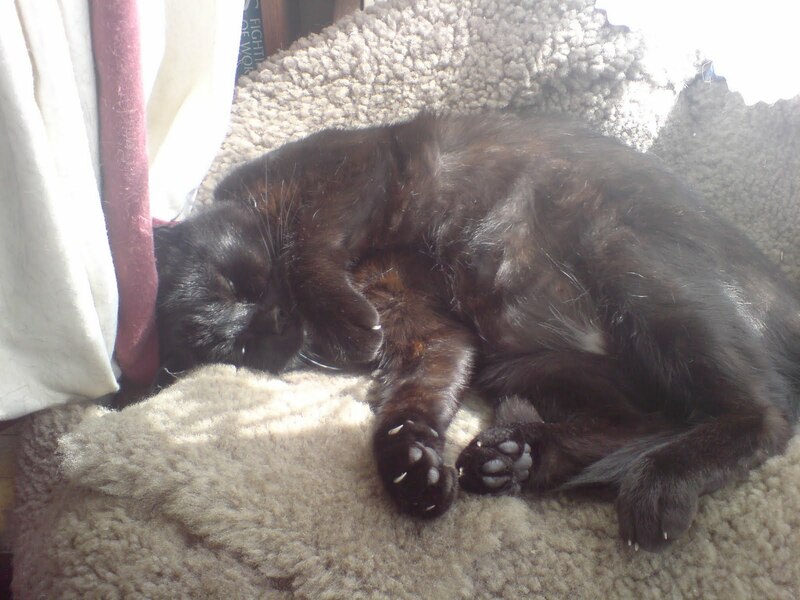 He’s cost us nearly £3,000 in vet fees as he suffers from lower urinary tract disease. It has to be carefully managed through diet and trying to keep him active….the latter is more difficult. This is Trouble, AKA Monkey head. Now he may look the same as Miew but he’s about half the size. He’s a cat who looks like he’s been put together with spare parts. We got this guy with his sister as a 1yr old, when my friend split from her husband and couldn’t look after them anymore. It took a long time to stop this one digging out the bin and stealing food, but now hes as settled as can be. He’s very laid back and a little bit tubby! ….and last but by no means least, this is Spice. She is Troubles’ sister. She isn’t the most trusting cat, and when we first got her she hid under things for a long time. We’ve had her for 10 years now and she’s totally different. We can have friends over and she even stays in the house, the same room even! 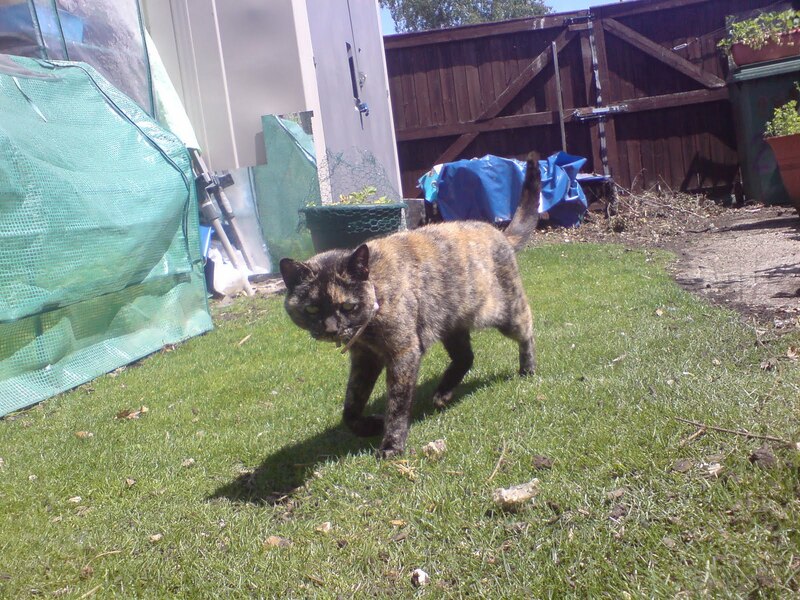 She’s happy and content, but needs careful monitoring as she is a fussy eater and drops weight very quickly. So that’s the current cats. 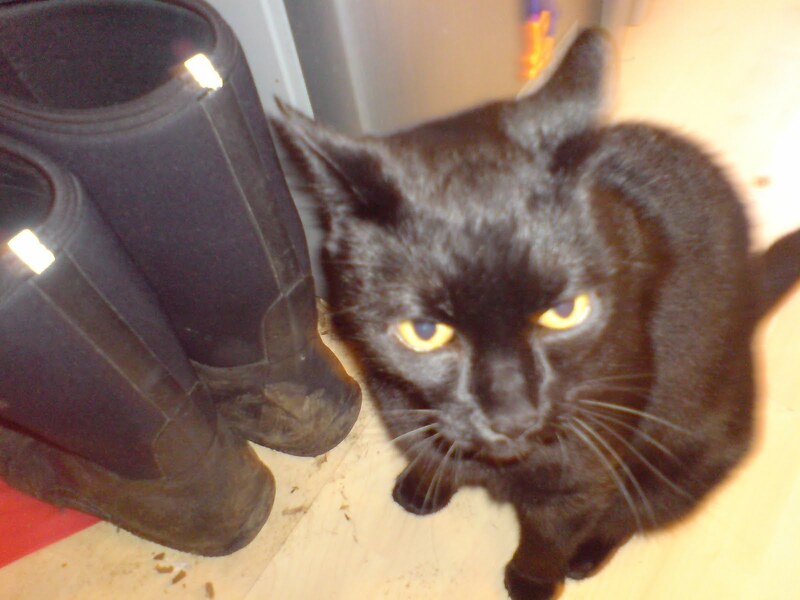 When I first moved in with my husband, I brought my childhood cat Tigger, he stayed with us till he was 14years old. We then sadly, had to have him put down as his back end stopped working. He was another urinary tract disease sufferer. I loved him dearly and we still have his ashes in a beautiful urn. I still haven’t taken the urn out of the cardboard box….. it’s been almost 7 years since he passed. I miss him terribly. Miew has turned out very much like him, as we bought Miew to keep Tigger company. Then we got Trouble and Spice and had 4 cats for a couple of years. Funny how things turn out. The hens are next. 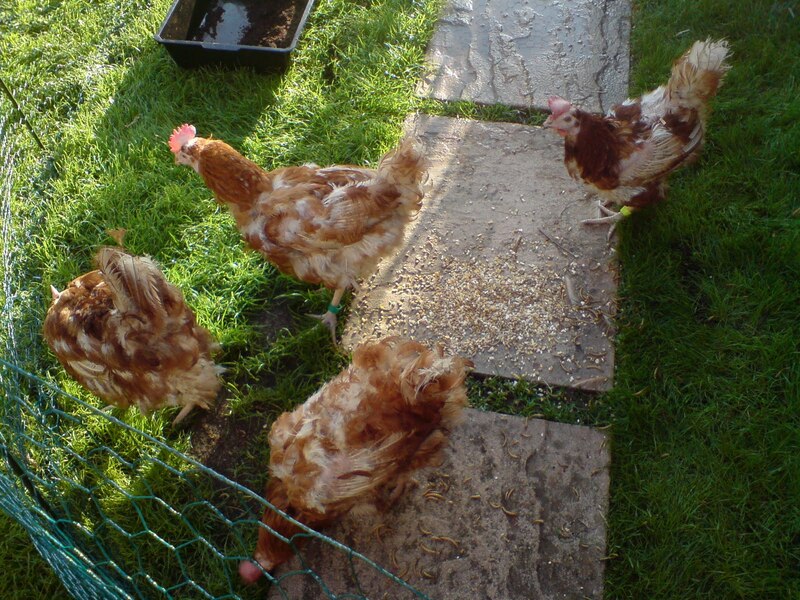 We originally got 4 ex-battery hens from the BHWT (http://www.bhwt.org.uk/) they were Mel, Terri, Crispy and Chicken 11. Mel was called Mel as she was brave (braveheart, Mel gibson?- yeah) Terri was called Terri as she had a green leg ring (Theresa Green, trees are green?) Crispy was called Crispy cos I wanted one called Crispy and Chicken 11 was named by our son, Alex cos he likes the number 11. They were a present for my 30th birthday as I’d always wanted some hens and we now had a garden big enough with some grass!!! Yay! So my husband arranged it all, bought the house and picked the girls up! When the hens come out of the battery farm, life is pretty scary! So they have to be kept in for a short time to reduce stress. 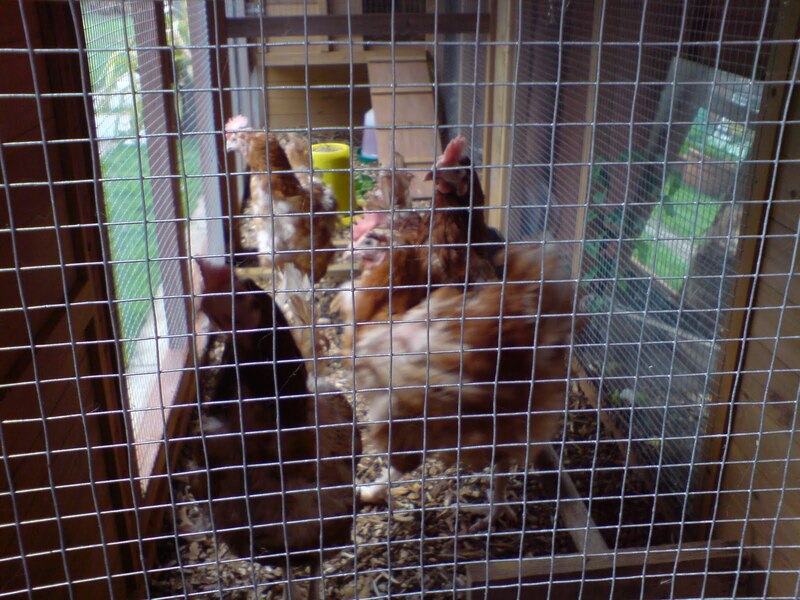 Here are our new girls in their new home! I felt really sad that anyone could let hens get into this state. Anyone who eats battery eggs is condoning this horrible practice. 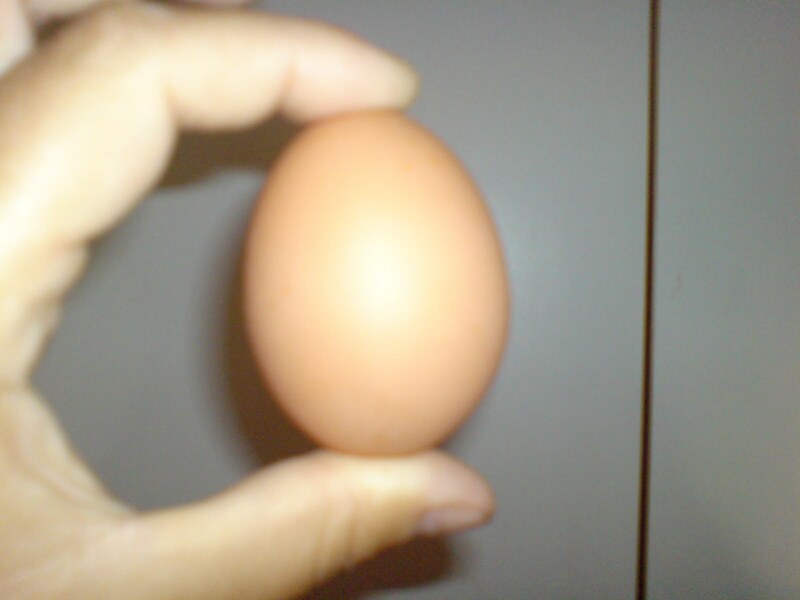 This is our first egg!!! I believe Crispy laid it. It’s very small compared to the ones she lays now a days!! But it was lovely. 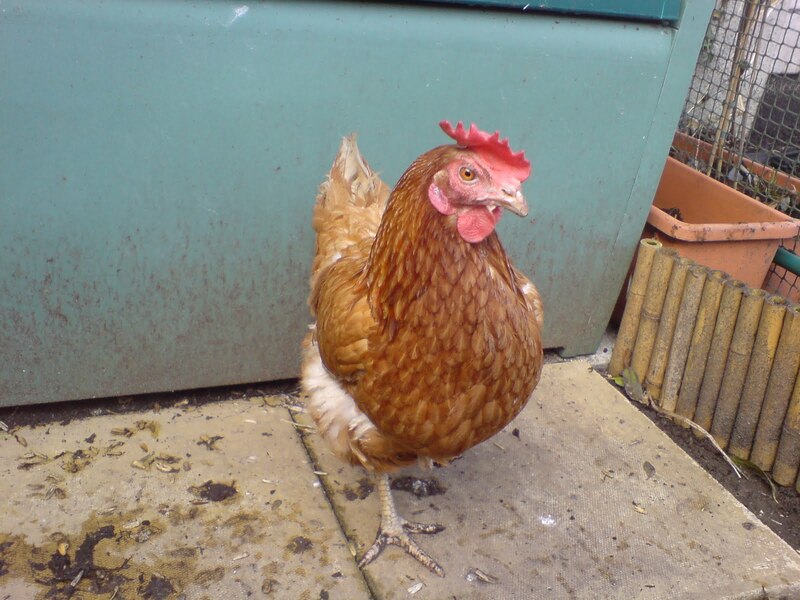 We’ve not had to buy eggs since, who says battery hens are spent? With love and care, they will lay you enough eggs for your family and even some for your neighbours too! Here are the girls the day after we got them! We’d fenced off a little area so they could have a bit of freedom and some grass! They’d never seen grass before, never had the sun on their backs and never been able to act like a hen should, so this was quite huge thing. Look how pale they are…. a lot of feathers were missing and they didn’t know what to do! It didn’t take them long however to work out that sunbathing is enjoyable!!! 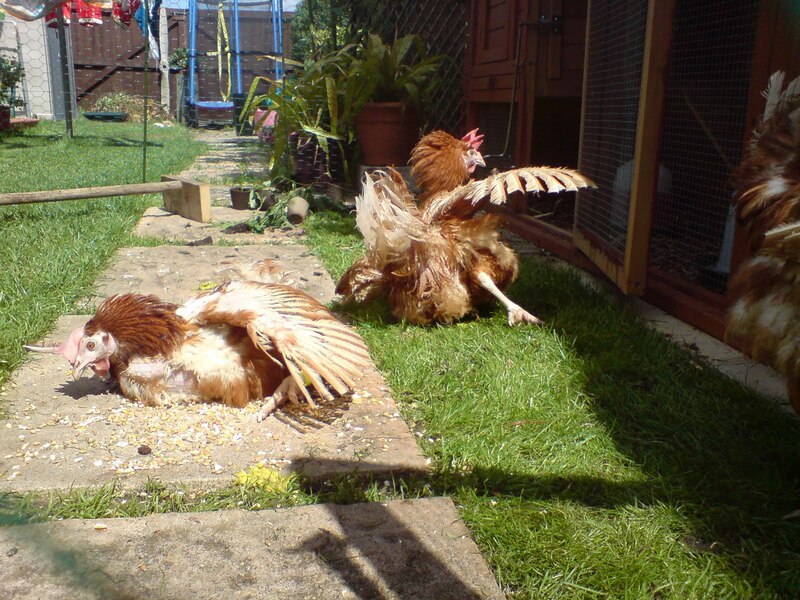 This is Chicken 11 (front) and Mel at the back, having a laze in the sun. It must feel heavenly after 18 months of not even being able to stretch your wings out….. again, battery farming is cruel and evil. The outstretched wings show how many feathers are missing….. It didn’t take them long to make themselves at home. 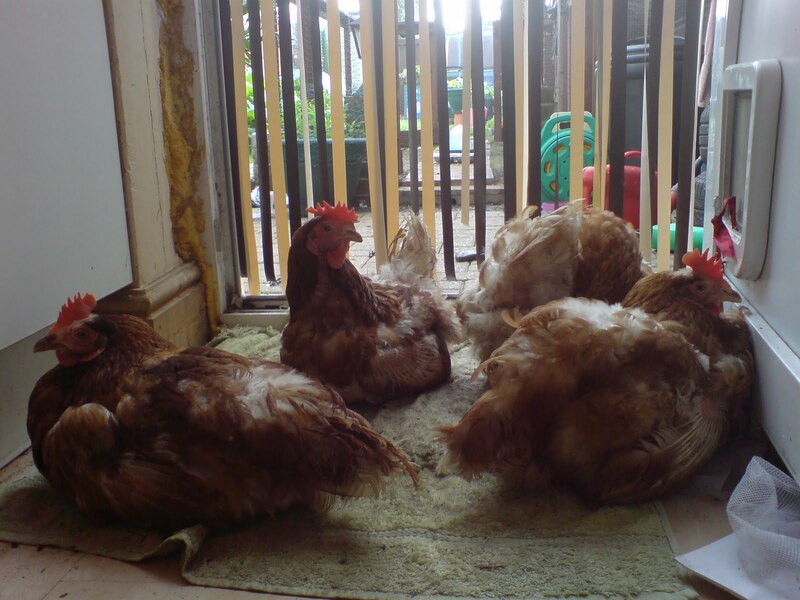 Here are all 4 girls asleep on the back doormat! They are so friendly and trusting, which is amazing considering what they’ve been through. This is only a few weeks after they came to live with us! Sadly, she had inhaled some of the liquid and it was in her lungs. There was nothing we could do. The vet and I decided the best thing to do was to put her to sleep. I was heartbroken. This is Chicken 11. We lost her in the spring, she suffered a nasty prolapse. We tried to help her, bathing, trying to push it back in, but to no avail, it was too far gone. She lasted 3 days until she started to feel unwell, we took her to the vet and there was nothing that could be done. She was scared of life, but hilarious, she had the most expressive face and a floppy bonnet for a comb! She is buried in the garden next to Terri as they were best friends. I shall leave it there tonight, but part 2 will be coming soon. More hens and some of the horses I have had the joy to work with. 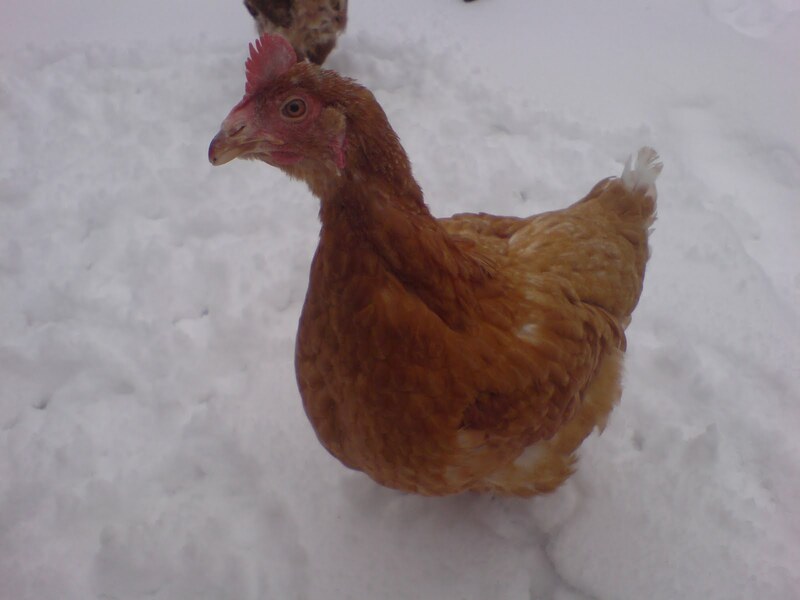 This entry was posted in Chickens, Hens, Horses and tagged animals, BHWT, cats, chickens, hens, loved, pets, sour crop. Bookmark the permalink.